To our faithful and cherished Family,We are so thankful to all of you for your support during these critical days. Your outpouring of compassion, in the face of the incredible misery of so many in the world, brings light and hope to our Family, Holy Mother the Church, America and the world.We find that several truly devoted souls from South America are stepping forward and asking to plant the Living Rosary in their countries ravaged by Communism, Masonry and Socialism. Dr. Debra has helped us reach into Nicaragua, Dr. Alberto has begun serious and solid work in Guatemala, and Javier in Cuba. We have beautiful Spanish materials and are ready for this new missionary thrust! Let us, with vigor, take up the challenge in Latin America to restore the Kingship of Christ through the Immaculate Heart of Mary and the Holy Rosary. Surely, it is Our Lady who is asking this of us.Look for the Summer Issue of Dedicated Decades (click here for a sneak peek) Included are wonderful letters from the places mentioned above, as well as personal testimonies of Our Lady’s intercession in the lives of our Living Rosary family.To help us raise funds for our work in Latin America, I want to announce a special raffle opportunity in celebration of the 25th Anniversary of the ULRA! The Living Rosary is vital to South America because it places our focus on the Propagation of the Faith, through a union of prayer and the corresponding announcement of the Gospel – all at the hands of the Virgin Mary. As you help us reach out to the suffering Church in Latin America you will have the opportunity to have a beautiful statue of St. Philomena painted by an artist from Cuba. Raffle tickets are only $5.00 or $20.00 for six chances to bring this gorgeous statue into your own home! You will find complete information in this issue of Dedicated Decades.We, who run in the way of love, must never allow ourselves to be discouraged by anything! When we yield to discouragement or despair, it is usually because we think too much about the past or the future. We have placed everything in the hands and heart of Our Immaculate Mother. We are but mere instruments ready to be used in whatever capacity she may wish to use us. The Living Rosary will celebrate its 25th Anniversary on December 8th this year, and we pray it will be robust and strong, united and growing for this momentous Anniversary. So many thousands have contributed greatly, in benefactions and zeal, in prayer and apostleship.One with you in the Heart of Mary!You are always in my prayers! Director of the Universal Living Rosary Association of Saint Philomena (ULRA). our work in Latin America! This beautiful handcrafted statue was painted by an artist from Cuba. In honor of our 25th Anniversary and to raise funds for our Latin America Mission Crusade, we are giving you an opportunity to welcome this gorgeous 23”statue into your own home. The Merciful Heart of The Mother of God – A Continuous Miracle! The Mother of God has rewarded the heroic faith that the people of the Iberian Peninsula showed during its 800 years struggle against the invading Moors. From Mexico to Tierra del Fuego, no nation has failed to receive singular favors from the Mother of God. She presents herself with unheard of magnificence and splendor, making it clear that she wishes to preside over Latin America from on high. The Holy Virgin stamped her image on the imposing cliffs of Guaitara Canyon in Colombia, thereby becoming Queen of the souls in that region and in all the surrounding lands.In the year 1754, Maria de Quinones, an Indian woman from Colombia was traveling from her home town of Potosi to the village of Ipiales. At a place called Las Lajas (the Rock), she sought refuge from a storm. It was said that the devil lived in the hillside grotto and Maria was filled with anxiety to be there. She asked the Virgin of the Rosary to keep her safe and Mary did. A few days later, returning the same route, she carried her daughter on her back. Little Rosa was deaf and mute from birth. Tired and needing to rest, Maria sat down near the grotto and her Rosa began suddenly to speak, “Mommy, look at the lady who has come from the rock with a little boy in her arms!” Rosa slid off her mother’s back to climb the grotto stones. Struck with terror, Maria took her child and fled from the place. She related the story to her family and friends. Then, she noticed that Rosa had disappeared. Feeling the child might have gone back to the grotto, she went looking for her. She found Rosa kneeling before the splendid Woman and playing affectionately with the Child who had come down from its mother’s arms. Maria fell to her knees before this beautiful spectacle and was no longer afraid. A short while later, Rosa became sick and died. Her grieving mother carried her to the grotto in order to beg the Virgin’s help. Our Lady of Las Lajas miraculously brought the child back to life. Word spread, pilgrims came and, amazingly, there was stamped on the rock a magnificent image of the Blessed Virgin Mary, holding her Infant Son, with St. Dominic and St. Francis kneeling at her feet. 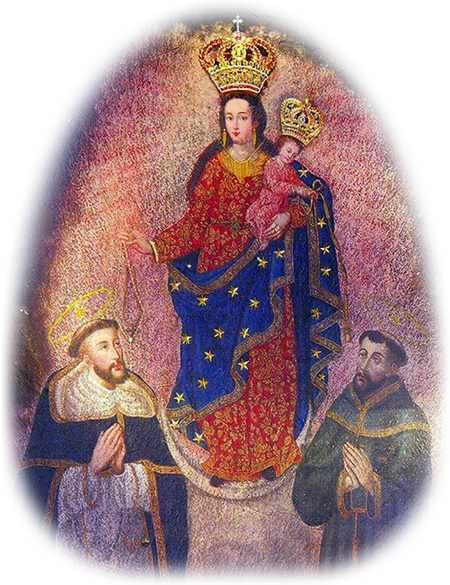 The Dominicans and Franciscans were the two Orders who first evangelized Colombia.The image of Our Lady of Las Lajas has lost none of its brilliance over the centuries. German geologists bored core samples from several spots in the image, and they determined there is no paint, no dye or any other pigment on the surface of the rock; the colors are the colors of the rock itself and they penetrate into the rock evenly for several feet. 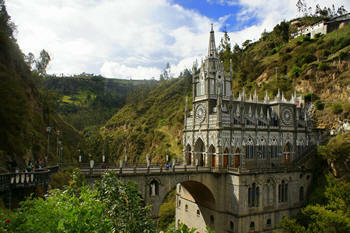 In 1952, Pope Pius XII granted canonical crowning of Our Lady of Las Lajas and, in 1954, a gorgeous gothic church was erected to house the image and was dedicated a minor basilica. Our Lady of Las Lajas portrays an extraordinary stability and solidarity, a calm and peace that nothing disturbs. There is no arrogance or ostentation about her, but rather the dominion of nobility. The color and richness of her dress is that of a Queen. She is extremely kind. How safe the Child Jesus feels in her arms! What throne could be more worthy of Him? They do not gaze at one another. 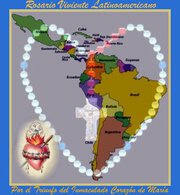 Mary directs her eyes toward the Latin American people heeding their supplications, guiding and commanding them. Meanwhile, the Child Jesus enters into the intimacy of those who arrive at the Queen’s feet. By the kindness of her gaze, Our Lady of Las Lajas moves us to trust her entirely.What an extraordinary invitation to us from the Queen of Las Lajas to bring to the faithful of Colombia the simple, powerful and spiritually rich devotion of the Living Rosary! Today, Colombia is the world’s largest producer of cocaine and heroin. Pastors have been silenced, young Christians martyred, churches closed down and many have been delegated to internal refugee camps. 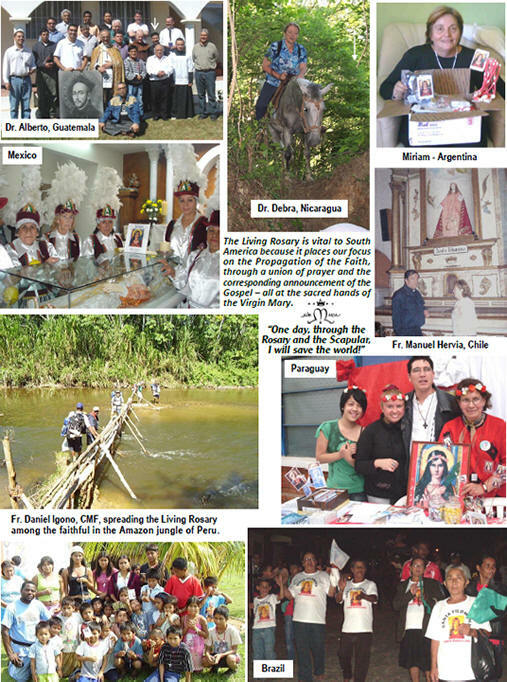 You are currently browsing the Universal Living Rosary Association of Saint Philomena (ULRA) blog archives for July, 2011.